Oven roasted monkfish over waxy potatoes. Watch for monkfish at the fish counter and the rest is easy. RB is one of the few who admits to watching Kevin Costner’s 1995 flop-buster film Waterworld more than once. It was the at-sea version of his all-time favorite Mad Max 2/The Road Warrior. We get why everyone was so dirty in Max’s post-Apocalypse desert, but why were they so filthy in Waterworld? If you ignored the critics and saw Waterworld anyway, surely you recall the scene where The Mariner baits himself to catch the ugly sea monster to feed his cranky passengers (including the very hot Jeanne Tripplehorn with those very chapped lips). Remember the big hunks of fleshy white meat he tossed on his rusty grill which they ate ravenously with bare hands without checking for bones? That was a giant monkfish. Monkfish is a surf and turf dream come true: meaty exterior like a charred steak with a sweet lobster-like texture inside. 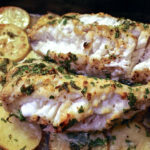 We usually grill monkfish because unlike most white fish that ends up falling between the grates, monkfish doesn’t flake and can even be cut into medallions before grilling. It’s often called “poor man’s lobster” for its similar look, texture, and more affordable price (@ $10/lb). Another bonus is that its center cartilage makes monkfish truly boneless. The fillet has a thin gray membrane that needs removing. 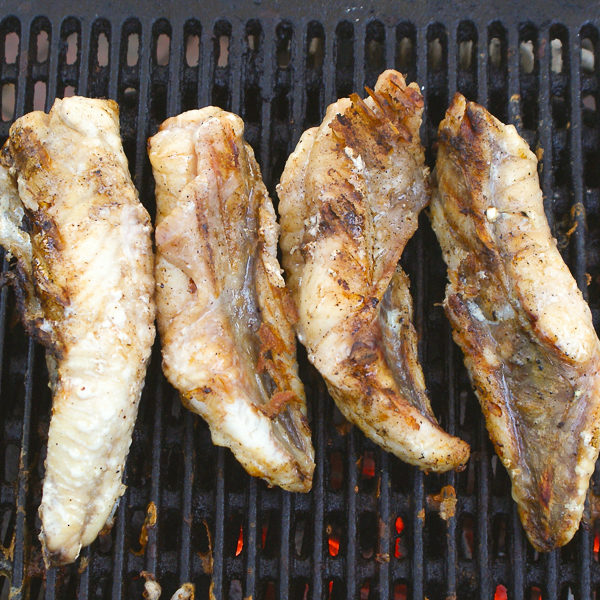 If you’ve ever pulled the membrane off a rack of pork ribs, then you’re ready strip a monkfish. 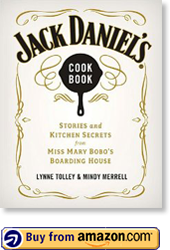 It’s not flaky, but nevertheless, handle with care on the grill using tongs and a spatula. A well-oiled fillet and grill grate make the process easier and the fish better tasting. Serve grilled monkfish any way you would a lobster or mild white fish. We grill the fillets rubbed with a little oil, salt, and pepper, and served with parsley and fresh lemon. They’ll go well with any quick sauce that complements your menu. Anything you can do with lobster or scallops you can do with monkfish. 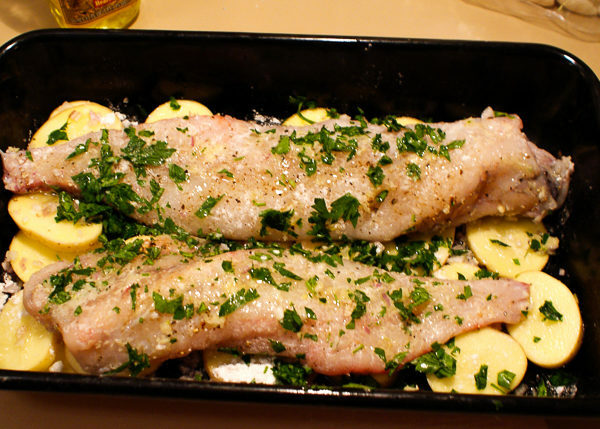 In the kitchen, roast monkfish in the oven over thinly sliced waxy potatoes. 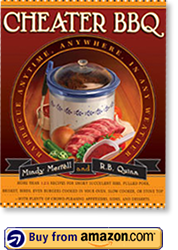 It’s a great cold weather dinner and a nice dinner party meal. Here’s our Grilled Monkfish Tacos with Chipotle Slaw that’ll make you think twice about tilapia in your fish tacos. Arrange the potatoes in a single layer in the bottom of a lightly oiled 9 x 13-inch roasting pan. Spread the shallots over the potatoes. Arrange the filets in the pan. Spread the garlic salt paste over the filets. Lightly dust the filets with the flour. Season with fresh ground black pepper and parsley. Roast the fish until it easily pulls apart with forks and is no longer opaque inside, about 30 minutes. Makes 4 to 6 servings.